This article guides you in how to back up iPhone calendars to your computer. Visit our Droid Transfer page if you need to backup Android calendars instead. Step 4: Press the Copy to PC/Mac button in the toolbar at the top of TouchCopy. Step 5: Select where you would like to copy to, and continue. 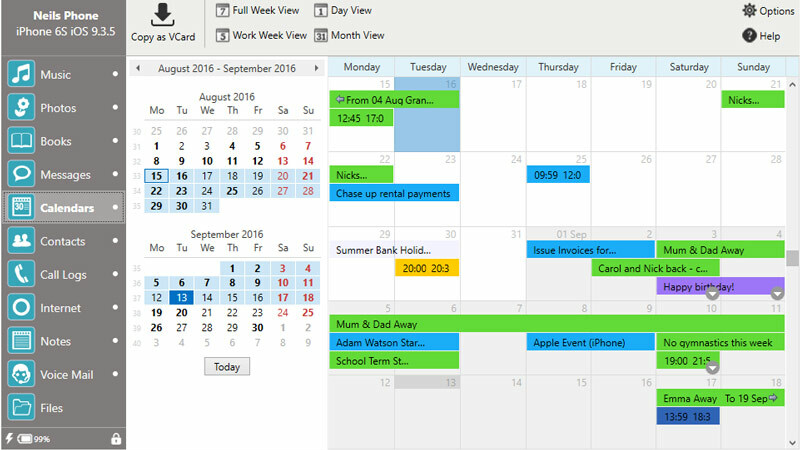 TouchCopy enables you to save your calendars from your device to your PC or Mac. The instructions below also provide details on how to transfer calendars copied by TouchCopy to another iOS device using iTunes. To view calendars in TouchCopy, click the "Calendars" icon in the category list. Export iPhone Calendar to Mac - In TouchCopy, press the Calendar button in the top control panel. This will display the calendars stored on your device. You can copy all your calendars by copying in TouchCopy without selecting any individual calendar entries. To copy individual calendars, click on the calendar you wish to copy and then copying in TouchCopy. You can copy your calendar selection (or complete calendar) directly to Apple's Calendar App by pressing the "Copy to Calendars" button. Alternatively, you can copy as iCal files to your Mac by using the "Copy to Mac" button. If you would then like to import your iCal files to your Calendar app, you can double click an iCal file which will open Calendar. Calendar will them prompt you to add this calendar to your existing calendar. For multiple files, on the Calendar app, go to File -> Import... and select all of your iCal files. You'll then import them into your existing calendar. By default your calendars will be saved as iCal files to your desktop. You can change the save location for your calendars in TouchCopy. Export iPhone Calendar to PC - In TouchCopy, press the Calendar button in the top control panel. This will display the calendars stored on your device. To copy individual calendars, select the calendar you wish to copy and then click copy. You can copy as VCard files to your PC by using the "Copy as VCard" button. If you would then like to import your VCard files to your calendar manager such as the Outlook app, you can double click an VCard file which will open Outlook. Outlook will then prompt you to add this calendar to your existing calendar. For multiple files, on the Calendar app, go to File -> Import... and select all of your VCard files. You'll then import them into your existing calendar. By default your calendars will be saved as VCard files to your desktop. You can change the save location for your calendars in TouchCopy. Once your Calender app has been populated with your iCal/vCard files, you can then use iTunes to sync your calendars with another iOS device. Connect your iOS device to your computer, open iTunes and chose your device under DEVICES in iTunes. Click on the Info tab in iTunes and check "Sync Calendars", and click on the "Sync" button.